In 2012, The Street Plans Collaborative and the CNU NextGen: The Next Generation of New Urbanists responded to growing demand and released the second volume of the Tactical Urbanism open-source guide. This volume takes insight from the authors as well as from over 150 people who attended the first Tactical Urbanism Salon in 2011. 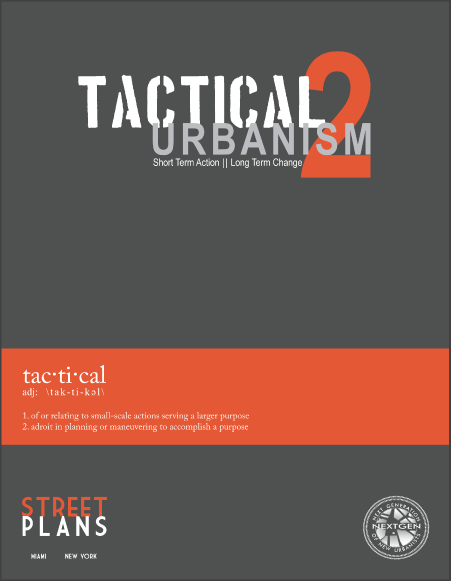 Volume 2 is more than an update of the first and includes a discussion of the rise of Tactical Urbanism and the spectrum of interventions. It also covers 12 additional short-term actions inspiring long-term change. These new interventions include: Pavement to Parks, Depave, Site Pre-Vitalization, Pop-Up Town Hall, Informal Bike Parking, Intersection Repair, Ad-Bustin, Reclaimed Setbacks, Park Mobile, Weed Bombing, Micro-Mixing, Park-Making, and Camps.